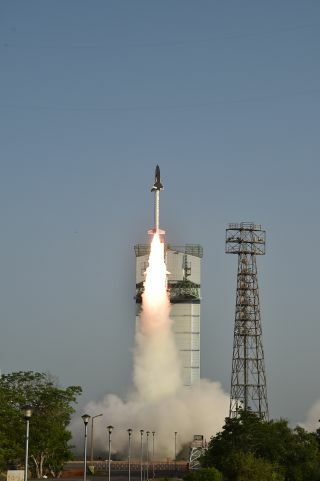 On May 23, 2016 local time, India launched the first test flight of its Reusable Launch Vehicle Technology Demonstrator, a winged, unmanned spacecraft that resembles a miniature space shuttle. India is now a member of the space plane club. The nation flight-tested its robotic space plane prototype, known as the Reusable Launch Vehicle-Technology Demonstrator (RLV-TD), for the first time Sunday night (May 22), said officials with the Indian Space Research Organization (ISRO). The 21-foot-long (6.5 meters) RLV-TD then came back down to Earth, hitting the atmosphere at five times the speed of sound and ultimately splashing down in the Bay of Bengal at a designated spot about 280 miles (450 km) from the launch site, ISRO officials said. They declared the 770-second mission a success. "In this flight, critical technologies such as autonomous navigation, guidance and control, reusable thermal-protection system, and re-entry mission management have been successfully validated," ISRO officials wrote in an update Monday. The RLV-TD, a key step forward in India's goal of developing a reusable orbital launch system, is the latest in a series of robotic space planes to take flight. India's 1.5-ton, robotic Reusable Launch Vehicle Technology Demonstrator launched for the first time on May 23, 2016 local India time. For example, the U.S. Air Force's X-37B vehicle — which is slightly bigger than the RLV-TD, at 29 feet (8.8 m) long — has performed four classified orbital missions since 2010, including one that is still going on today. And the European Space Agency launched its Intermediate eXperimental Vehicle (IXV) on a brief test flight to suborbital space in February 2015. Then there are the crewed space planes. The most famous, of course, was NASA's space shuttle, which carried astronauts on a total of 135 orbital missions between 1981 and 2011, when the fleet was retired. The Soviet Union also developed a similar shuttle, called Buran, which was designed to carry crews, but whose single spaceflight, in 1988, was uncrewed. The Buran program was canceled in 1993, shortly after the fall of the Soviet Union. Several crew-carrying private space planes are currently in development as well. Virgin Galactic and XCOR Aerospace are working on suborbital vehicles called SpaceShipTwo and Lynx, for example, and Sierra Nevada Corporation is building an orbital space plane called Dream Chaser. In addition, the British company Reaction Engines Ltd. aims to build a single-stage-to-orbit space plane called Skylon that would be capable of carrying up to 30 passengers. None of these private vehicles has reached space yet. SpaceShipTwo has conducted four rocket-powered flight tests in Earth's atmosphere, though the most recent test, which occurred on Oct. 31, 2014, ended in tragedy; the vehicle broke apart in midair, killing co-pilot Michael Alsbury and wounding pilot Peter Siebold. A new SpaceShipTwo vehicle, the VSS Unity, was unveiled by Virgin Galactic in February of this year.